Opening directly after the 2018 mid-term elections and during a contentious period in the history of the nation, Al Farrow: Divine Ammunition casts a striking visual commentary on the contemporary political climate, religion, war, history, culture and faith. Through the display of twenty-four of Farrow’s ornately rendered sculptures of churches, synagogues, mosques, mausolea, ritual objects and reliquaries created from munitions, the exhibition examines the relationships between religion and violence, peace and brutality, the sacred and the unholy. The sculptures—miniatures in surprisingly ornate detail—have been described as haunting, beautiful, disturbing, powerful, mesmerizing, visceral, exquisite and jarring. Crafted with guns and gun parts, bullets, lead shot, shell casings, steel, bone, glass and cluster bomb, the defining contradictory words aptly portray the majesty of the arched clerestories, complexly illustrated geometric patterns, magnificently constructed flying buttresses, gables, spires, and minarets that characterize the sculptures and the materials used to craft them. Born in New York City in 1943, Al Farrow describes his Brooklyn roots as mired in the traditions of the “old world.” In his twenties, the artist moved to northern California, where he became engaged in the socio-political movements of the late 1960s. “Something really clicked when I started using real guns and bullets,” recalls the artist, who had trained as a draftsman, studying Medieval architecture. Farrow’s unique exploration began after a trip to Italy over two decades ago, when, as noted in the exhibition catalog, Farrow was confronted with a reliquary containing the remains of an ancient saint. A major form of artistic production across Europe and Byzantium throughout the Middle Ages, reliquaries had significant impact upon the economy and architecture of these regions, as pilgrims flocked to pay homage to the holy relics stored within the cathedrals built by the labor and offerings of the pious. Invoking ancient religions and modern munitions, and linking the destruction of cultural heritage to human loss, Farrow demonstrates the essential role of art, even—perhaps especially—during tragic times. 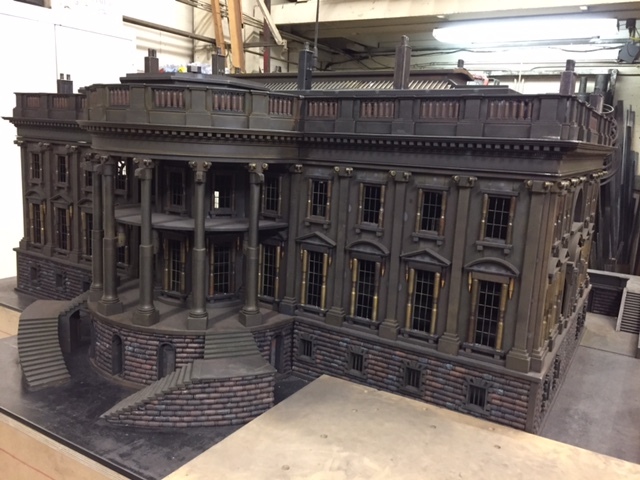 With his newest work, The White House, rather than represent a fantasy of uncorrupted liberty and “purity” evoked with the name and very color of the structure, Farrow’s sculpture is finished with a corroded exterior and somber palette, a subtle portrayal of how the façade of democratic ideals has become corrupted by abuse of power, and a reminder of the violence that constantly undercuts our truer freedoms. In the current era, in which we’ve witnessed a rise in violence perpetrated at churches, temples, mosques and schools, the exhibition Al Farrow: Divine Ammunition offers an opportunity to reflect on conflict and constructive creation through the consideration of sculptural material and the sculpture’s final forms. Minnesota Street Project, 1275 Minnesota St.
Museum of Craft and Design, 2569 Third St. The Museum of Craft and Design welcomes Parkland activist, Marjory Stoneman Douglas High School student and author David Hogg, to San Francisco to share his personal story and vision for change in our country. Hogg’s new book, “#NeverAgain” will be on sale during the event at both locations and in advance of the lecture at MCD’s Store. *The event at Minnesota Street Projects is followed by a ticketed reception and book signing with Hogg at the Museum of Craft and Design. Both arts venues are located within walking distance of each other in the historic Dogpatch district in San Francisco. Born in Brooklyn, New York, Al Farrow has lived in the San Francisco Bay Area for more than thirty years. An accomplished sculptor in a wide variety of media, Farrow generally adopts the language of a particular historical period for his work, updating the imagery or material to make cogent observations about contemporary society. One particularly notable project was a set of bowls created in the style and method of the Mimbres people, an indigenous culture in what is now Northern and Southwestern Mexico. For this body of work Farrow meticulously painted in their traditional style, using a single reed brush to render images of B-1 bombers, tanks, radiation symbols, and other military imagery. In recent years he has used materials referencing the military-industrial complex—munitions and steel–to make three-dimensional artworks that resemble Christian reliquaries and churches, Islamic mosques and mausolea, and Jewish synagogues and ritual objects. In 2008, Al Farrow’s work was the subject of a solo exhibition at the Fine Arts Museum of San Francisco (de Young Museum): In The Name of God: War, Religion and the Reliquaries of Al Farrow, which was accompanied by a catalogue authored by Timothy Anglin Burgard. In 2015, a traveling, monographic exhibit of Farrow’s work curated by Diana L. Daniels had its institutional debut at the Crocker Art Museum, Sacramento, California, and was accompanied by a catalogue. Farrow’s work is represented in many institutional collections: All Saints Episcopal Church, Los Angeles, California; Crocker Art Museum, Sacramento, California; di Rosa Center for Contemporary Art, Napa, California; Fine Arts Museums of San Francisco, California; Government of the State of Israel; Gregg Museum of Art and Design, Raleigh, North Carolina; International Contemporary Art foundation (21c); San Francisco Museum of Modem Art, California; San Jose Museum of Art, California; and Wanås Foundation, Knislinge, Sweden. He lives and works in Northern California and is represented by Aeroplastics, Brussels, Belgium, Forum Gallery, New York and Catharine Clark Gallery, San Francisco. Al Farrow: Divine Ammunition was organized by Forum Gallery, New York and Catharine Clark Gallery, San Francisco. The exhibit debuted at Forum Gallery in March 2015 under the title Al Farrow: Wrath and Reverence. It subsequently traveled to the Crocker Art Museum in Sacramento, 21C in Louisville, the Bellevue Arts Museum and the University of Wyoming in 2017. It will continue to the Southern Utah Museum of Art in 2019. The exhibition checklist has grown since the show’s inception and Farrow’s most recent work, The White House, will debut at Museum of Craft and Design. Al Farrow: Divine Ammunition is accompanied by a 112-page color catalogue Wrath and Reverence with essays by Eleanor Heartney and Diana L. Daniels, and a foreword by Pulitzer Prize-winning reporter Chris Hedges, author of War Is a Force That Gives Us Meaning.